Michelle Towle is Head Nurse at a small animal practice and she clearly loves her job!“I wanted to be a veterinary nurse when I was a little girl. It’s all I ever wanted to do. We couldn’t have pets at home because my mum was allergic-that made me even more determined!”Michelle is clearly in her element, particularly as her unofficial assistants-an elderly rescue golden retriever and a young poodle/retriever rescue dog-go to work with her every day. There are two nurses at this practice to cover two shifts: one works 8:30 am until 5:30 pm and the other, 10:15 am until 7:15 pm on alternate days. Day patients come in between 8:30 am and 9:30 am to be greeted and settled in and the various admission procedures followed, including form-filling. 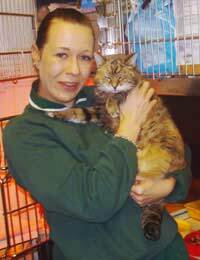 “Another of the first, but most important, jobs is to give animals that have been in-patients during the previous night some TLC! Their cages have to be cleaned out, drugs and feeds given, as appropriate, temperatures, heart rates, respirations are done, then the vet checks them over when she comes in as well. "Between 9 and 11 am consultations take place. They can be anything from boosters to blood tests, anything. We may have to help by holding the animals, helping them to remain calm when they are nervous or scared. One of the nurses assists Hazel in theatre-which often consists of up to 5 surgical procedures in one morning. Operations like castrations, spaying and x-rays are all routine, but there are more unusualcases too. Equipment and surfaces have to be cleaned up and kept sterile throughout and animals monitored. Notes and records are updated on the computer for each animal before the afternoon consultations begin at 2pm. “There’s a lot of time spent tidying up! More importantly, though, there’s a lot of time spent with the animals-they can be a bit groggy after the anaesthetic and need reassurance.When the owners come to collect them, we like to spend some time with them, to talk about their pet’s operation and after care and make sure they are OK too!”That is one of the main attractions of a small veterinary practice; Hazel and the team know their patients and clients by name. They are aware of pets’ backgrounds and health-often caring for them from birth to death. How Do You Learn to Cope With Euthanasia of Animals?